When I’m introduced to a new indigenous ingredient, I experience a similar reaction to that of a prospector unearthing a new mineral deposit. My eyes alight. I examine and prod and my fingertips tingle. I giggle. I have an urge to squirrel away what I come across until, that is, my taste buds demand a part of the action. These are flavors few people out of Africa have tasted. Every Zambian who works with me, either at the restaurant or on the farm, is aware of my enthusiasm to learn about indigenous ingredients I haven’t used before. Ephraim Nyambe, a young kitchen assistant who I employed at the cafe in his first job, was the one to bring my attention to masawa fruit. He arrived at the café with a palm-sized bag of fruit he’d bought from the market with his own money. “Here,” Ephraim said. “Try these. They are called masawa.” Raw, the grape-sized fruit hinted of apple; boiled down into a purée, masawa WAS apple. Masawa fruit, bought from Dambwa Market in Livingstone. Inji Masawa Ice Cream with Seasonal Mulberries & a Mongongo Nut Florentine. At The Elephant Café I only use fresh ingredients that are grown locally or foraged from the bush, therefore I’ve never considered flavors like apple, or those derived from stone fruit, in my recipe development. The weather is just too hot to grow them here. With the discovery of masawa this changed. And then, when my senior chef, Lovedale Nombwana, introduced to me to another tiny wild fruit called inji which, when eaten raw, tasted like dates, but when cooked with the more robust masawa resembled apricots, I bought in bucketloads. Burnt orange in color, with loads of pectin and elasticity, we have turned both fruits into bottles of purée and syrup, to use in desserts, glazes, and preserves. Nzembwe, one of many indigenous millets, that can be purchased from Livingstone’s Dambwa Market. Sandra Libetwe shows me how to dehusk the nzembwe with a pestle and mortar on the farm. Gluten-free and healthy, nzembwe has replaced quinoa and couscous–both of which are imported–in all our recipes. One of our winning recent finds at the market has been finger millet, or nzembwe. First introduced to me by Adelina Banda, the Zambian with whom I have worked since I arrived here nearly four years ago, we now use it in place of Andean quinoa, couscous and pearl barley. 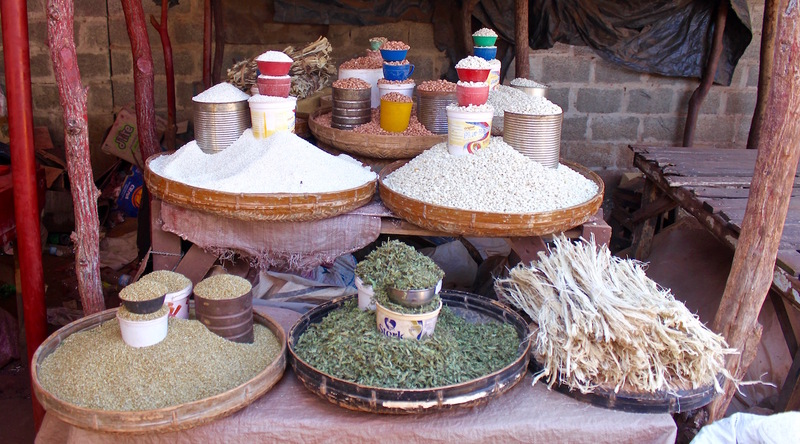 Nzembwe has the nuttiness of quinoa, the texture of pearl barley, and is gluten-free. Just the other day I used it in place of pearl barley in my Roasted Beetroot and Goat’s Cheese Salad, and our customers raved about it. There are other varieties of millet in the market with which we will experiment over the next few months. Please watch this space! Mongongo nuts, after they have been removed from their rock-hard shells. Mongongo Nut, Basil & Nasturtium Leaf Ravioli with Garden Peas & Lime-infused Beurre Noisette. It was the huge mongongo tree, under which we live, that set off my experimenting with Zambian wild edibles in 2013. When the fruit started crashing down on our tin roof, like gun shots, rolling onto the ground all around our house, I was eager to find out what the nuts inside tasted like. I have since written many blog posts about mongongo nuts. They are my go-to ingredient when I need a crunch, some fat … or a je ne sais quoi. I use them in biscotti, florentines, ravioli, salads, ice cream, and praline. They also make a tasty vegan mayonnaise because the nuts are so soft and oily. Baobab, Orange Blossom & Nasturtium Flower Elephant Cookies. The baobab tree, as I have written previously, levitates above our semi-arid landscape, and to me is the n’anga of trees, the magical medicine man, the traditional healer. Its fruit is healthy, versatile, visually appealing, and lasts for months. I use baobab, or mubuyu, powder in place of sumac because of its tartness. The texture and color are pole opposite — sumac is russet brown and grainy, baobab is coral pink and silky — but as ingredients they offer something similar to a dish. We remove the baobab seeds from the clutch bag-size pod, and pound them in a pestle and mortar to harvest the pink powder with which they are coated. Beetroot & Muchingachinga Soup with Coconut Milk. We have muchingachinga fruit growing all about our garden. It’s another fruit with which I began to experiment not long after I moved to Livingstone. Of all the flavors I have tasted from the bush, this is the most unusual. It’s a combination of bittersweet and sour, and eaten off the tree will make your mouth pucker. Turned into a blood red syrup or coulis, it becomes something else altogether. We add only a little sugar because I like to emphasize the bittersweet and sour. I recently added muchingachinga to both a beetroot and roasted red pepper soup, in an attempt to cut through each vegetable’s sweetness. The muchingachinga tasted completely different in each, but the flavor of both soups was sensational. Thai-inspired Tilapia Ceviche with Avocado, Pomelo & Roasted Peanuts. A satisfying by-product of working with wild food is the enrichment of low-income riverside communities who assist me with foraging and preparing the ingredients. In addition, almost every Zambian I’ve worked with here in Livingstone has said they had no idea the wild fruit, nuts, pulses, leaves and roots they grew up eating, mostly raw, could be used to such effect in gourmet cuisine. Today I watch the servers at the café explaining the wild ingredients in our menu to our international guests, and it makes me proud. That I’m working with, and teaching, young Zambian chefs how to use their own natural ingredients in gourmet food that is appreciated by a global audience is also deeply satisfying. Musika, or tamarind. So far I have used this wild fruit in braised dishes only. I’m looking forward to experimenting with it much more in the months ahead. I want to try all of it!! Truly inspirational and innovative Bella! Thank you, as always, for your support and interest, Bridgey. We are having so much fun! Wonderful!!! Hope to get there soon. Thanks so much, Martine. I hope you get here soon, too! just to I can dine at your magnificent restaurant. What a really kind comment, thank you, Madison. The whole experience at the restaurant: the jet boat ride from Victoria Falls, the interaction with the elephants, and then the dining experience, is a once-in-a-lifetime treat I highly recommend! Thank you, Georgie. The best part is the experimenting. My staff and I are all invested in the outcome and it makes the kitchen such a fun place in which to work. Come and visit! I’ve just stumbled on your blog. I just returned from three weeks in Zamia a few days ago. I wish I had found you before and come to visit at the restaurant whilst in Livingstone. For next time! !